High in the sky above Lompoc, California, a freefalling Staff Sgt. 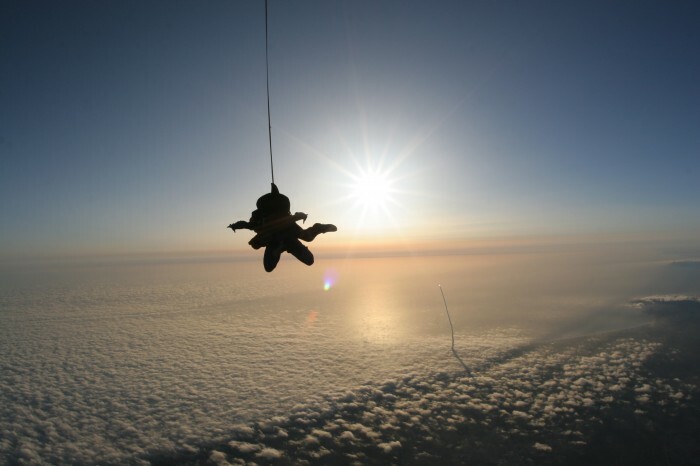 Eric Thompson planned his skydive to coincide with the June 7 liftoff of a Delta 2 rocket from Vandenberg Air Force Base. The Delta 2 carried the Italian Thales Alenia-Space COSMO-SkyMed satellite, placing it into Earth orbit. Thompson is an instructor with the 532nd Training Squadron. The spacecraft will take imagery of the Earth using an X-Band Synthetic Aperture Radar instrument at the request of institutional and commercial users, including members of the defense, civil and scientific communities. Thales Alenia Space-Italia developed the COSMO-SkyMed program for the Italian Space Agency and the Italian Ministry of Defence. While more than 50 Italians have been working on base at Vandenberg to prepare the satellite for sendoff, another 150 flew in from Italy to observe the event. It’s a sure bet that Thompson had the most unique view in the house. I thought they’d have a no fly zone when launching a rocket. Huh. No fly zone isn’t a couple miles large… that rocket pretty far away. Not pictured: Two seconds later, WORLD’S MOST AWESOME ENEMA!